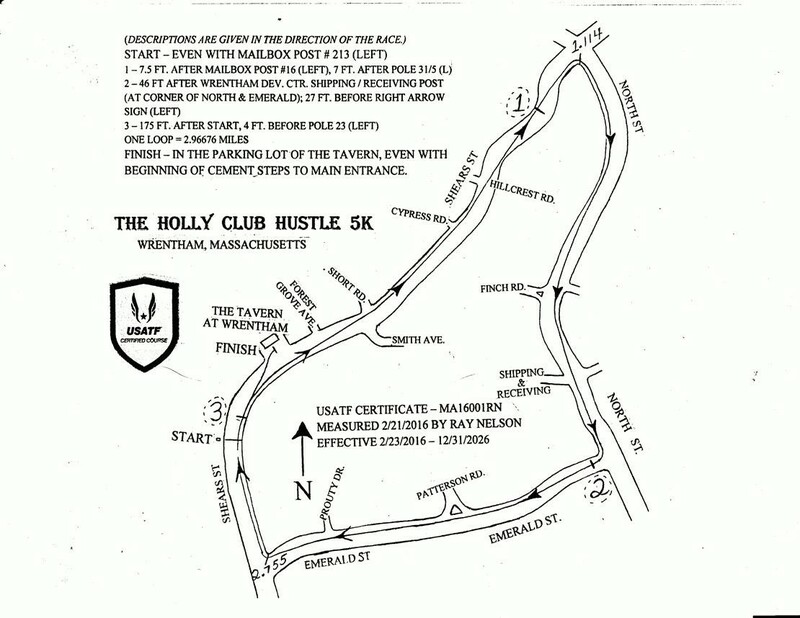 Welcome to our fifth annual Holly Club Hustle 5K Run/Walk! 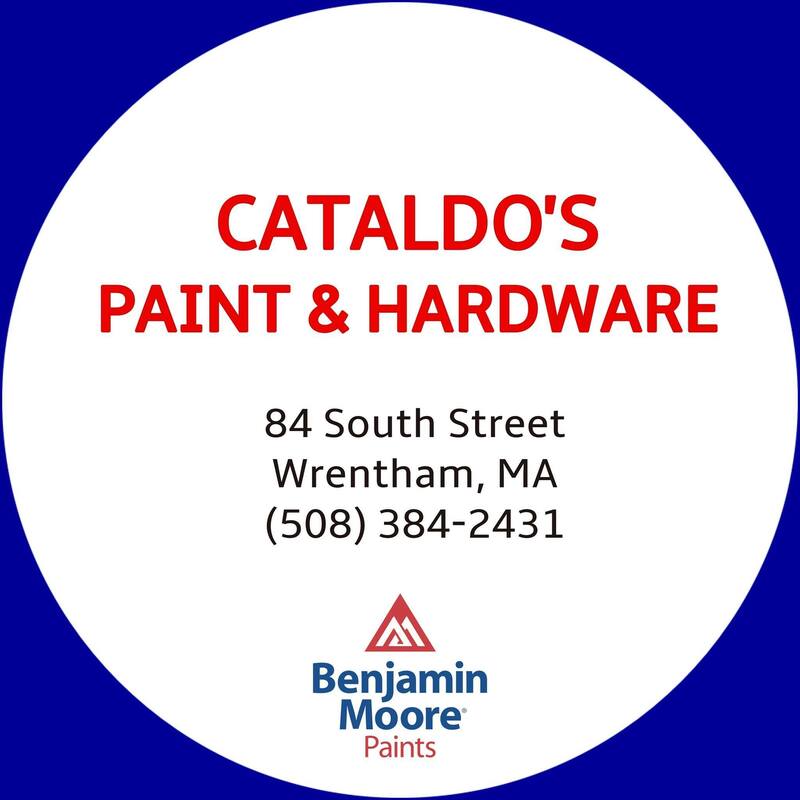 Our volunteer non-profit group has been fundraising and helping out in the Wrentham area for over 100 years! All funds raised through this event will be used to support the Holly Club's various programs such as scholarships to high school graduates, donated money and goods to Wrentham Food Pantry, Veterans, DARE, KP Parent Network, DECA, Mass Star, Destination Imagination, Wrentham Elementary Schools, Wrentham Nursing Homes, cookies for our senior citizens, Fiske Library and more! 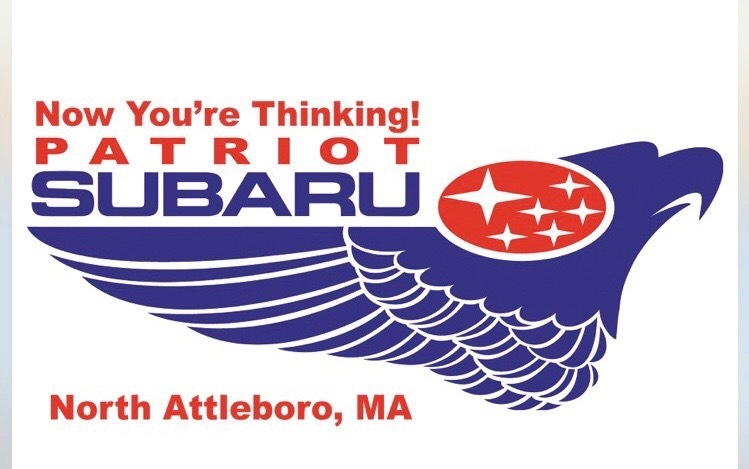 This course is a certified 5K that will begin and end at the Tavern in Wrentham. Check-in before the race for your t-shirt, breakfast ticket, raffle ticket and number pick-up. 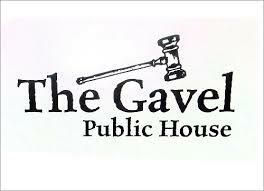 After the race, enjoy breakfast at the Tavern along with raffle opportunities! Winners will be announced at the Tavern after the race. 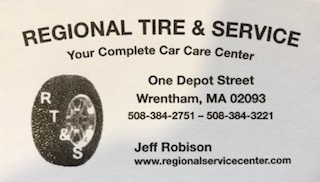 Parking and registration are at The Tavern at Wrentham, 263 Shears Street Wrentham. USATF Certified Course. Mostly flat with occasional slight rolling hills. Start and Finish adjacent to parking and number pick-up registration site. $35 per runner/walker. Ages 12 and under are only $15 per runner/walker. 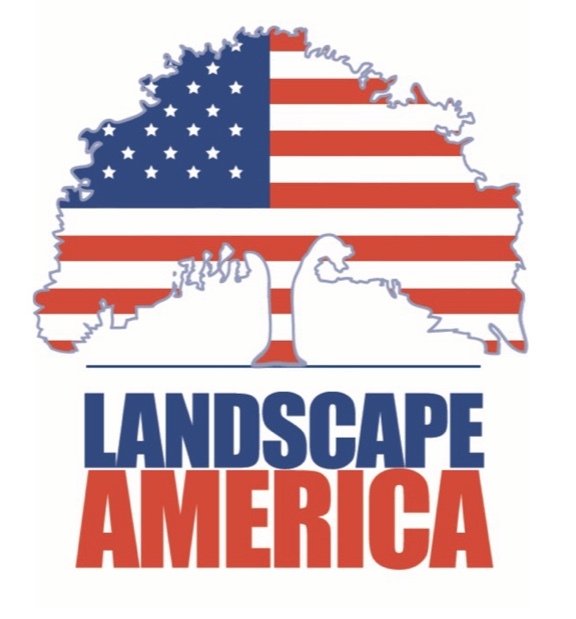 Participants registered by March 16, 2019 are guaranteed a T-shirt and will receive 1 free raffle ticket for their choice of prizes. After March 16, 2019 participants will receive 1 raffle ticket. Registration: REGISTRATION OPENS 8:30 a.m. RACE DAY!! Many exciting raffle prizes will be drawn at the awards ceremony following the race! We will also have a 50/50 Raffle! Raffle tickets are $2 each or 3 for $5. All race participants will receive 1 free ticket with their bib number. Must be present to win. REGISTRATION OPENS 8:30 ON RACE DAY! 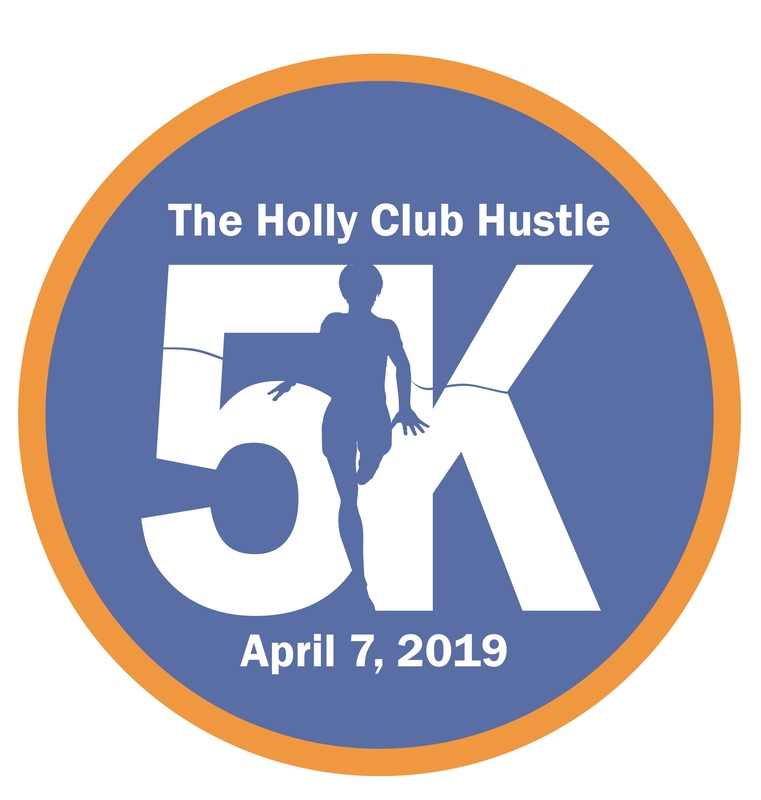 As a participant in the Holly Club Hustle 5K and all its activities on 04/7/19, I know that running is a potentially hazardous activity. I should not enter or run this event unless I am medically able and properly trained. I agree to abide by any decision of a race official relative to my ability to safely compete the run. I assume all risks associated with running in this race including , but no limited to, falls contact with other participants, insect bites, the effect of weather, including high heat, cold or precipitation, the conditions of the road and traffic on the course, all such risks being known and appreciated by me. 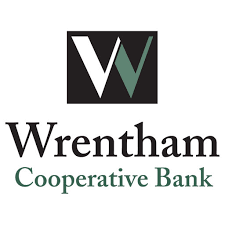 Having read this waiver and knowing these facts, and in consideration of your acceptance of my application, I, for myself and anyone entitled to act on my behalf, waive and release the Holly Club of Wrentham, all race sponsors, organizers and volunteers of this event; the Towns of Wrentham and Norfolk, The Wrentham Developmental Center, The Tavern at Wrentham; their representatives and successors, from all claims or liabilities of any kind arising out of my participation in this event even though that liability may arise out of negligence or carelessness on the part of the persons named in this waiver. All fees are non-refundable. I give permission to the Holly Club to reproduce prints and display in all print and electronic format, any photographs of me. I understand that these pictures will be utilized to promote the programs and activities of the Holly Club.